Don’t settle for a life that feels out of balance, where you have to neglect yourself to care for others. You have the life you have always wanted. Then why do you feel so stretched? You are surrounded by the people you love, but you are feeling so out of sync. The time you need to get it all done and really enjoy your loved ones seems to allude you. You find yourself wondering if your purpose goes beyond cleaning up after others, taking those you care for to appointments, or changing diapers. At times, you feel like you will drown under the pressure. You are giving so much and feel like you don’t have the energy for all that you need to do… You would love a life in which you would have the time for the things you really want and be at peace and present with the people you care for. 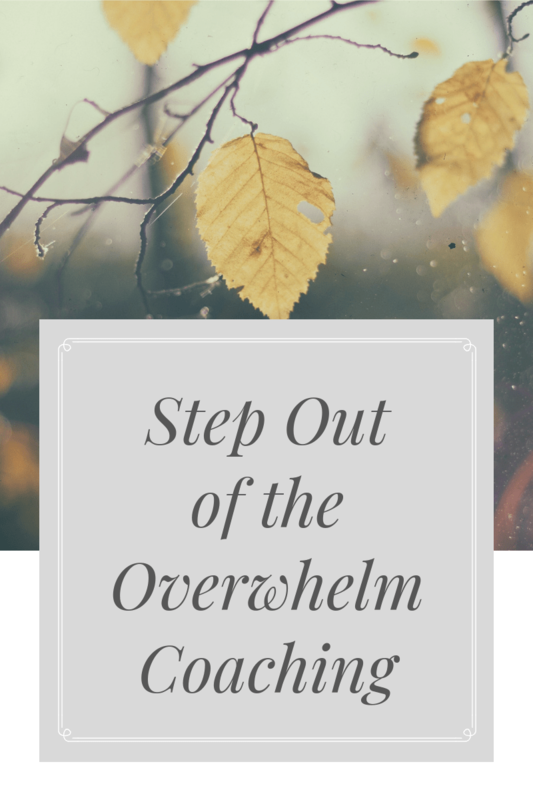 I created Step Out of the Overwhelm because I know what it’s like to be that woman caring for others wondering if my purpose is more than my daily tasks, and I have seen that look on the faces of friends who are caring for their children and parents. We want to be doing it but it takes more than going through the motions for you to enjoy it and feel balanced while caring for your parent or child. I help to move you from a life of going through the motions to a life where you are present with the people you care about. Then based on our strategy session you will complete the discovery paperwork and hand picked assessments to pave the way for our work together. Seven 40-minute coaching sessions that take place over 2-3 months to fit best within your schedule. We will partner together to discover your calling/purpose as you care for others, increase your time and energy, and discover ways to bring your gifts and interests to life in your everyday life. The program is offered at a discount of $280 if paid prior to the start of the program. You also have the option of making two payments of $160 due at the beginning of each month.